The unemployment situation facing the United States, especially concerning the future situation, is of critical importance. This situation will impact the entire U.S. population, not just those unemployed. While unemployment and its drivers are of critical importance, trends in wages and earnings is a related issue that has disconcerting long-term trends. Both of these aspects have strong impacts on both the U.S. economy and society as a whole. Sustained periods of strong employment and wage growth has been a primary feature of periods in the United States in which there was widespread (and lasting) improvements in people’s economic condition and standing. During these periods much (upward) migration occurred, such as those moving into the “middle class,” culminating in a substantial “middle class” as well as other positive changes. Given the importance of the U.S. employment situation, I have written extensively on the subject. 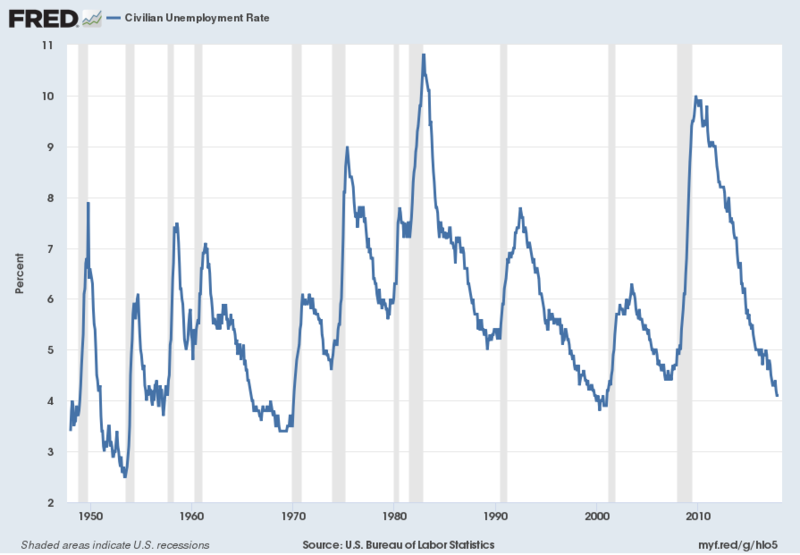 Previous discussions are found under the “Unemployment” category, including the April 24, 2012 five-part post titled “The Unemployment Situation Facing The United States”, which discusses various problematical issues concerning the present and future employment situation. Below is a discussion of various aspects of the U.S. unemployment situation. As this topic is vastly broad and complex, only a few topics will be discussed to avoid excessive complexity and length. It should also be noted that the current and future unemployment situation varies widely among demographics, industries, and professions. As such, while every person’s employment situation is unique, there is enough commonality from an overall aggregate perspective as to be able to generalize to some extent. As seen in the chart, unemployment, as defined by this measure, appears to be at a very low level from a long-term historical perspective. The unemployment rate has declined precipitously since the 2009 high. Another widely observed measure is the U-6 rate, which is currently (as of January 5, 2018) at 8.1%, and it has also greatly declined since the year 2010 peak. Nonfarm payrolls rose a seasonally adjusted 148,000 in December, the Labor Department said Friday. That brought employment gains for the year to 2.1 million, the seventh straight year of increases exceeding two million. It is only the second time on record—the other being in the 1990s—when the economy has produced jobs at that pace for that long. However, there are many aspects of the employment and unemployment situation that I find to be highly troublesome. I find various aspects of the framework, measurement, definitions, and methodologies used to calculate the statistics to be problematical. Given such problems, it is difficult to say with a high degree of certainty as to what the “actual” unemployment situation is; however, there are many indications that the very widely-held assessment that currently “employment is strong” and, as an extension, that no substantial unemployment problems exist – in reality – (substantially) lacks support. It is unfortunate that the official (U-3) unemployment rate, depicted above, is the most prominent of unemployment measures, as the measure suffers from various shortcomings. 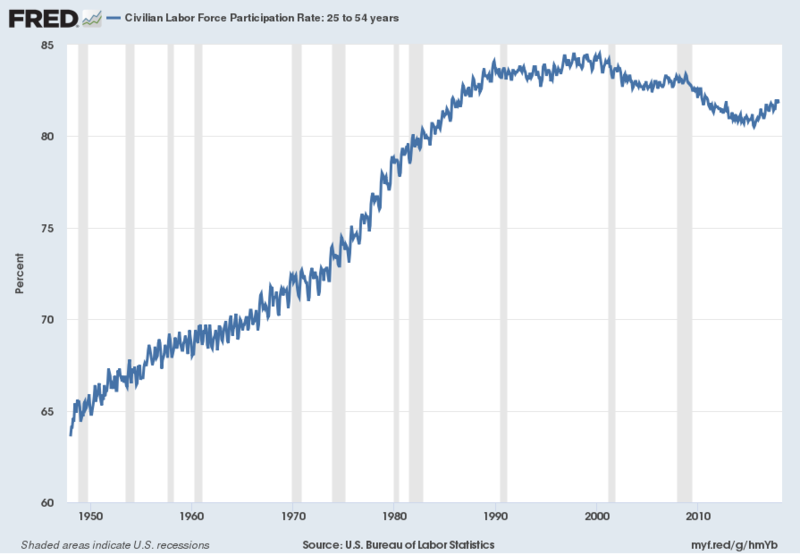 Perhaps foremost of these shortcomings is its treatment regarding those that drop out of the labor force, which is an issue of tremendous importance. As discussed above, in my opinion the official methodologies used to measure the various job loss and unemployment statistics do not provide an accurate depiction; they serve to understate the severity of unemployment. However, even many of the official statistics provide an interesting (and disconcerting) long-term perspective of various unemployment aspects. Another disconcerting aspect of the unemployment situation is the “Not In Labor Force” statistic. 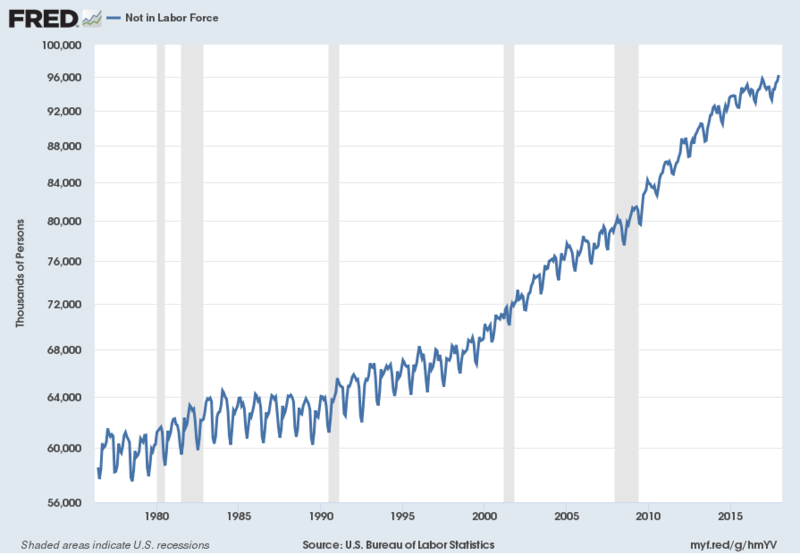 I have written of this measure and its trends in the past, most recently in the December 11, 2017 “‘Not In Labor Force’ Statistic – As Of December 2017” post. It should be noted that many different factors have led to the current unemployment and accompanying income situation. Many of these factors lack proper recognition. Going back many decades, one of the primary factors that has reduced the need for employment is automation, first in the form of tools and machines, and later, computers and robotics. Another major factor, which appears to have come into prominence since roughly the late-80s, has been the loss of manufacturing and services to lower-cost countries. Many factors will determine the future U.S. unemployment situation. Of course, it will be highly dependent upon the overall economic environment, which in itself is highly problematical for many reasons. However, there are many other important factors as well. Automation, in the form of robotics, algorithms, self-driving vehicles, etc. appears to be a major factor regarding the need for future labor. While many believe that “new opportunities” will present themselves to those displaced because of technology, these “new opportunities” at present lack definition. To believe that there will be the same if not more jobs created than lost due to future automation seems highly optimistic from an “all things considered” perspective. Due to various factors, future displacement of workers by technology will probably occur even in situations where the automation is still more expensive than the worker. Another factor that may lead to continued U.S. unemployment is continued loss of jobs to countries with cheaper labor. From a business perspective, there are other issues as well. 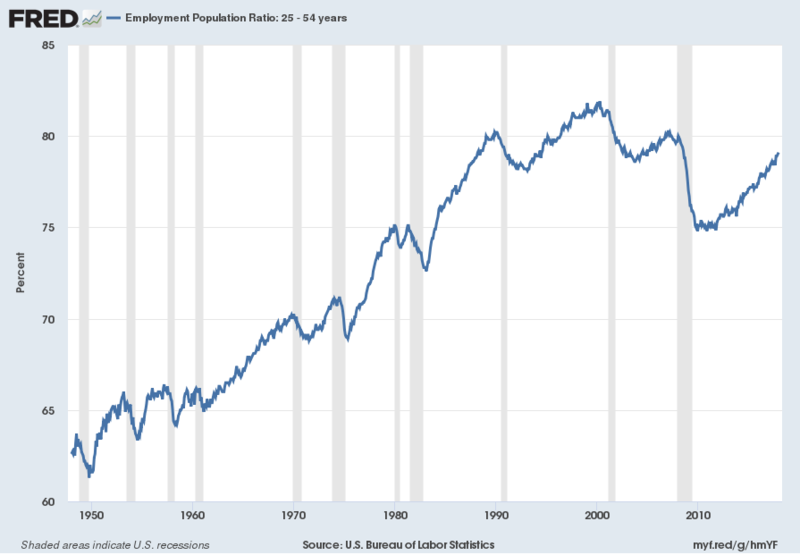 One of the major issues is one which I discussed in the aforementioned “The Unemployment Situation Facing The United States” post. The issue has to do with the level of overall corporate U.S. profit margins, which over the last few years have experienced substantial growth to record levels. Given the various problematical issues of the employment situation despite this increase in corporate margins (as well as increases in other metrics such as corporate revenues, stock market performance, credit market performance, etc) can strong growth in employment (and wages) be expected going forward, given a (very) likely peaking of profit margins? From an “all things considered” basis it seems rather improbable, and likely highly so. While the widely-held assessment is that U.S. employment is “strong,” and that few if any substantive problems remain with regard to unemployment, the actual situation appears to lead to a far different conclusion…that of the underlying dynamics of the current – and especially future – unemployment situation remain exceedingly worrisome. The overall U.S. employment situation is highly complex, and is driven by many different factors. These numerous factors and the overall dynamics greatly lack recognition and understanding. As previously stated, trends in wages and earnings is a related issue that also has highly worrisome long-term trends. These worrisome trends also serve to reinforce that the levels, trends and quality of employment, from an “all things considered” standpoint, remain worrisome.